GREG Eastwood is the new "Tommy Terrific". That's the celebratory cry reverberating up King Street, after New South Wales Cup side Newtown Jets secured the prized signature of the former Kiwi international and two-time NRL grand finalist. Not since NSW and Kangaroos legend Tommy Raudonikis made Henson Park home in 1980 as a 29-year-old has the club recruited such a decorated footballer. A skilful and versatile forward who can hit like a freight train, Eastwood racked up 27 Test appearances for New Zealand and was a member of the triumphant World Cup (2008) and Four Nations (2010 and 2014) teams. So it's no surprise Jets director Glen Dwyer is raving about the coup. 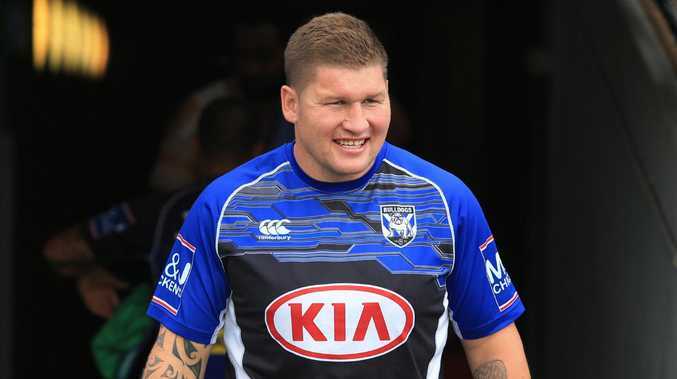 "Greg Eastwood signing for Newtown at this stage of our history - having come back out of oblivion years ago and now being a respected member of the Intrust Super premiership - is the biggest signing since Tommy Raudonikis," Dwyer told foxsports.com.au. "The arrival of a fellow like Greg Eastwood and what he brings in terms of experience, demeanour and leadership can't be understated. "In the team at the moment there are quite a number of young blokes who are either straight out of, or not long out of the under 20s, so to have Greg arrive with more than 260 NRL games and 27 Test matches and the respect of every club he's played at, will benefit the others so much." Dwyer laughed when reminded that a huge second half from Eastwood in last year's NSW Cup grand final helped the Bulldogs edge the Jets in a thriller. "He's sort of like the poacher turned gamekeeper, he beat us last year and now he's with us... we believe he has the package of skills to take us one place better to a premiership," Dwyer said. The 31-year-old certainly has the mongrel and aggression of Raudonikis, who set the gold standard for Jets recruitment almost 40 years ago. "Tommy brought a winning culture, a competitiveness and never-say-die attitude," Dwyer continued. "He was just the absolute ideal signing for Newtown in 1980 because he led by example with his attitude to training and tough play, and of course he led us to the grand final in 1981. "He was just tailor-made to lead the team that Warren Ryan had put together." While players such as Kangaroos skipper Boyd Cordner, Dally M winner Roger Tuivasa-Sheck and Dragons premiership hero Jamie Soward have worn the famous blue and white, they were all signed by the NRL clubs that the Jets were aligned with. Eastwood, on the other hand, is only Newtown's. The best since Tommy.